Vegans practice complete abstinence from the use of animal products in diet or as a commodity. People following the vegan lifestyle abstain from eating meat or meat-derived products and exclude eggs and dairy products as well. Other animal by-products such as gelatin or animal rennet are also avoided. Honey, silk, and other insect products may also be considered unsuitable for use or consumption. Donald Watson coined the term “vegan” in 1944. 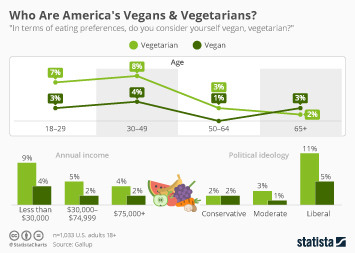 Since then, the interest in veganism has experienced continued growth. It became more mainstream in the 2010s, as demonstrated by the continued increase in the number of products labeled as vegan between 2015 and 2020. The share of product launches featuring the term “vegan” has also continued to increase exponentially. In 2017, the sales value of vegan or vegetarian food stood at around two billion U.S. dollars in the United States, a figure which grew about 23 percent over the previous year. Vegan diets are typically based on fruits, vegetables, legumes, grains, nuts and other seeds. Vegan meat substitutes are usually created from common sources of plant protein. Dairy alternatives, such as almond milk, soy milk, and rice milk, are also common staples of a vegan diet. In recent years, almond milk has experienced significant growth in popularity worldwide, with a market value of 1.85 billion U.S. dollars in 2016, which is projected to grow to over five billion dollars by 2024. According to a 2016 survey, people from the Asia Pacific region are the most likely to follow a vegan diet. A survey of U.S. adults found that about 60 percent of consumers considered a vegan diet to be healthy, and 12 percent of Americans under the age of fifty years identified as vegan or vegetarian in 2016. More interesting topics from the industry "Eating Behavior"